Ever heard the saying that you can’t eat money? Take a second to think about the last meal you ate and ask yourself where the seed that grew it came from. Chances are most of us are not really sure. In addition to farmers who grow the world’s food, we’ve got plant breeders to thank for our meals. They’re the unsung heroes building the foundation of our food system one seed at a time. Plant breeders have an incredibly important bank they can turn to for the essential tools they need to create crops for the future—the National Plant Germplasm System. Right now, plant breeders are raising the alarm that this bank needs attention—attention from everyone who depends on seeds for survival. For the past 10,000 years or so, humans have evolved alongside plants by selecting the ones that fit our needs and domesticating wild species for cultivation. And since nature isn’t static, plant breeding is an ongoing endeavor ensuring human survival. Plant diseases change, climates change, and human tastes change, making the key to a resilient agriculture system a hardy and biodiverse seed supply. Plant breeders select plants that fit their goals. Depending on their region, the farmers they work with, and the crops they focus on, they might be creating carrots in a rainbow of colors or something even more novel like a habanero pepper that isn’t spicy. Some plant breeders focus on making plants resistant to a nasty disease or veggies that are super nutritious. While plant breeders keep eaters in mind, they also think about what farmers need—and that’s usually uniformity, flavor, and performance. Farmers look to breeders for plants that will germinate and ripen around the same time to help with farm planning and labor. Customers, like produce buyers or chefs, look for produce that’s similar in size and shape and tastes good. But there’s a bit of a rub. The selections plant breeders make each year to reach these goals end up narrowing the genetic diversity in the crop over time. That’s because the uniformity we see on our tables, like all of the cherry tomatoes in a clamshell being about the same size, is the result of narrowing the variation in the plant’s gene pool. This isn’t necessarily a bad thing for the plants, farmers, or the eaters. Good plant breeders walk the line between developing a plant that’s reliable for the farmer while keeping the genetic pool big enough to allow for future breeding. This is how humans have co-evolved with plants through time—by selecting ones that have traits we need and replanting their seeds. It’s an ongoing process, which means that plant breeders are almost always on the lookout for new or wild genes to continue it. But because of the increasing privatization and use of restrictive intellectual property practices in the seed industry, plant breeders are having a more difficult time finding genetic resources they need to improve crops. The National Plant Germplasm System plays a vital role by banking unrestricted seeds for plant breeders throughout the world. If you’ve ever eaten a carrot, you might owe Dr. Phil Simon a thank you. Simon is a USDA/ARS plant breeder at University of Wisconsin-Madison who’s been breeding carrots and collecting seeds around the world for decades. It just so happens that he grew up in Sturgeon Bay, Wisconsin—down the street from a National Plant Germplasm System bank, this one housing the potato collection. Simon went on his first collection trip in 1989, just after the Soviet Union collapsed. At the time, the National Plant Germplasm System was the model of plant genetic resource collection for the world. Germplasm exchanges were one of the first things shared between the United States and Russia, and Simon was on one of the early trips. He’s been on about ten expeditions throughout his life, including a trip that took him to Poland, Syria, Turkey, and Greece in 1999. Simon spent eight and a half weeks stopping in every town they passed to see what seed they might find. He says that often it’s the men they interact with first, who then introduce them to the seed keepers of the old varieties: the women. On that collection trip, Simon stopped in a small town in Turkey. It was mid-morning and a group of farmers were taking tea. After introductions, Simon asked if they had any carrot seed from old local varieties. One of the farmers sent Simon to his mother who, as it turns out, was an avid seed saver. She’d been planting, growing, collecting, and storing seed for years—stewarding the old varieties. Simon met with her and explained that he was a plant breeder interested in local varieties. She headed up to the attic and came down with a paper bag of carrot umbels dripping with seed. Simon found 30 different types of carrots in those bags. As is the protocol, he left half of the seed they’d collected with the local scientist and deposited the other half into the National Plant Germplasm System where—to this day—it can be withdrawn by any farmer, researcher, or plant breeder who’d like it. Much of the National Plant Germplasm System’s collection wouldn’t exist without the work of Indigenous seed keepers and traditional farmers (like the Turkish farmer’s mother) throughout the world. Plant breeders, farmers, and eaters everywhere are indebted to the people who steward the world’s seeds in the fields, and communities committed to the relationships between plants and people. Movements and organizations like the Indigenous Seed Keepers Network, White Earth Land Recovery Project, and Seedshed are working to ensure seed sovereignty for the communities who’ve stewarded these precious resources for generations. The germplasm system is home to over 590,000 unique “deposits,” known as accessions, of plant genetics that represent over 15,000 species. It’s one of the biggest distributors of plant genes in the world, welcoming free withdrawals from plant breeders and researchers in the United States and internationally. In 2015 alone, the National Plant Germplasm System filled over 239,000 requests. Some portion of my dinner last night was likely to have been financed by this bank. 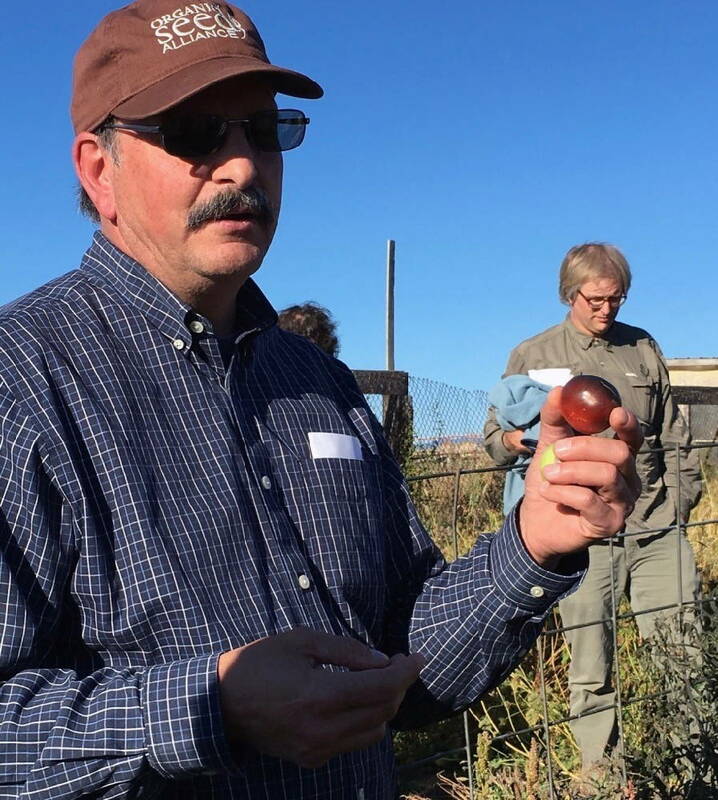 After earning his Ph.D. from the plant breeding and genetics program at the University of Wisconsin-Madison, Dr. Jim Myers moved to Oregon State University and has been running a breeding program in Corvallis since 1996. His Indigo Rose tomato was bred exclusively with seed Myers withdrew from the National Plant Germplasm System. This uniquely dark blue and red-hued tomato has a terrific flavor, disease resistance, and is high in antioxidants. According to farmer Shirley Young of Young Earth Family Farm in Randolf, Wisconsin, it’s one of her best growing tomatoes, and her customers are drawn to the unique color. His research team found that scarlet runner beans were a good source for this resistance and went to the gene bank to make a withdrawal. He requested several hundred types of scarlet runner beans and went to work, putting the new withdrawals in the greenhouse and searching for plants that didn’t succumb to the disease. After identifying the plants that were resistant to white mold, his team began the process of introgressing those plants into common beans. For nearly a decade, Myers held on to the unused scarlet runner bean seed he withdrew. But seed is alive and can only be stored for so long before losing its viability. Plus, storing large quantities of bulky beans takes up a lot of room. After so many years on the shelf, he threw away the extra seed figuring that it wasn’t usable anymore. Not too long after, the germplasm bank contacted Myers saying they had “lost a lot” of their Phaseolus coccineus accessions and wanted to know if he had any of that seed left. “We had discarded our decade-old seed only a few months before,” Myers laments. Today, only about a quarter of the scarlet runner bean collection is available for withdrawal. That doesn’t mean that three-quarters of it is dead, as some may be in the safety deposit box rather than the checking account. In some cases, it could mean the bank in charge of managing the seed is short on funding or staff and can’t make it all available for withdrawal. Either way, this raised red flags for Myers. Each collection has its own suite of management needs, and scarlet runners aren’t the easiest to maintain. The plants are large, day length sensitive, and susceptible to diseases. But maybe the trickiest part of maintaining this particular collection is increasing it. The National Plant Germplasm System staff makes more seed by growing some of what’s in storage and saving the seed from the plants. These new seeds replace the aging ones. This has to happen to each collection, and the way it needs to be done depends on the seed’s biology. In the case of scarlet runner beans, the plants are largely cross-pollinated, which means to get a copy of the same bean each plant needs to be pollinated by hand to be sure the copy is genetically the same. A technician has to open, or “trip,” each individual flower to transfer pollen to just the right spot for pollination. This takes some serious staff time and a budget to support it. Managing this massive system with federal and state funding is no small feat, and it’s on shaky ground. There are 19 gene banks throughout the United States, including a national research laboratory in Fort Collins, Colorado. Seed is a living resource that needs monitoring to ensure it stays “viable” or doesn’t die in storage. The National Plant Germplasm System relies on highly trained staff, federal and state funds, and several committees to do this. In addition to a handful of advisory councils and coordinating committees, the system relies on 43 crop-specific committees that monitor health and diversity. These teams look for gaps in their crop’s collection and keep an eye on the seed that’s getting old or at risk of dying in storage. The National Plan Germplasm System is in desperate need of support and attention. 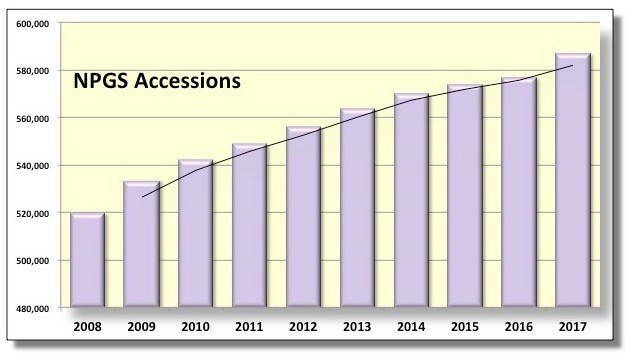 While the collections continue to grow, funding for them has flattened—as shown in the graphs below provided by Peter Bretting, Crop Production and Protection National Program Leader for the Agricultural Research Service of the United States Department of Agriculture (USDA). The NPGS's collection continues to grow. But the funding has plateaued. 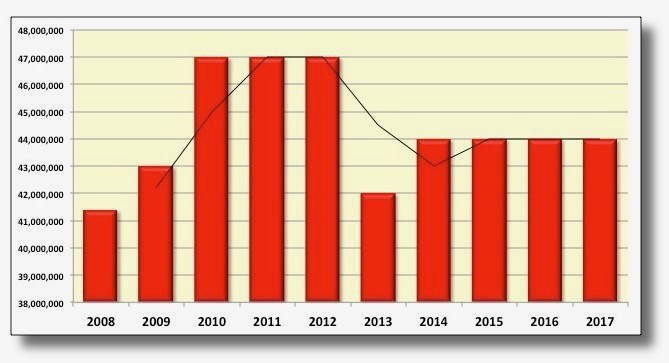 As these figures suggest, the USDA budget for the National Plant Germplasm System has plateaued while the number of accessions continues to increase, an imbalance causing serious concerns in the plant breeding community. Plant breeders around the country are sounding the alarm that these vital banks need more support—and fast. Organizations working on seed, like Organic Seed Alliance, Seed Savers Exchange, the Svalbard Global Seed Vault, and the National Sustainable Agriculture Coalition, argue that a vibrant, functioning National Plant Germplasm System is necessary to ensure we have crops to grow in the future. For instance, the National Plant Germplasm System is the biggest contributor to the Svalbard Global Seed Vault, sometimes ominously known as the “Doomsday Vault.” This vault is built into the side of a frozen mountain near Norway and keeps a backup to the world’s food supply in case of disaster, whether human or natural. It’s more like a safety deposit box than a bank, storing and monitoring over 890,000 deposits from the 1,700 gene banks throughout the world. The vault opened in 2008 and proved its worth less than 10 years later. The first withdrawal was made in 2016 by Syrian researchers to support a collection damaged during the civil war: pivotal crops of wheat, barley, and grass. Without seed banks, we’re living a high-risk life. Cathleen McCluskey has worked on seed issues and storytelling for nearly a decade and is a graduate student in the Agroecology Program at University of Wisconsin–Madison. Her work focuses on germplasm management, on-farm genetic diversity, and farmer-centric seed systems. Contact.